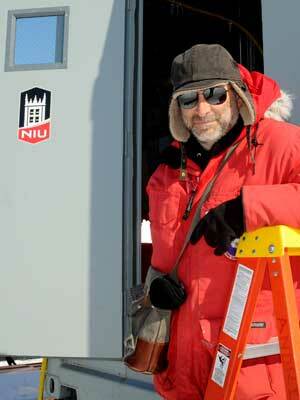 Antarctica is melting, according to evidence brought back to Illinois by NIU Geology professor Reed Scherer and his students. At the next STEM Café, Scherer will discuss his Antarctic research, why it matters and what it reveals about global climate trends. The free talk and discussion will be held from 6:30 to 7:30 p.m. Tuesday, Dec. 1, at Eduardo’s Mexican Restaurant, 214 E Lincoln Hwy. in DeKalb. Guests are encouraged to then walk to the nearby Egyptian Theatre to attend a 7:45 p.m. screening of “This Changes Everything” and the subsequent panel discussion. Illinois winters just aren’t cold enough for Scherer. In January, while the rest of us are shivering and shoveling, he can often be found in Antarctica. His research findings have important implications of life on our planet. “The rate of ongoing change in the climate and environment appear to be unprecedented by anything in the pre-industrial era,” says Scherer, an expert in micropaleontology and an associate of NIU’s Institute for the Study of the Environment, Sustainability, and Energy. These changes do not mean the world as we know it is about to end, Scherer says. Much of Scherer’s research focuses on the fossils of single-cell organisms called diatoms. In the planet’s polar regions, their remains tell a detailed story of climate change over time. This past winter, he was part of the team that drilled beneath the Ross Ice Shelf, where they discovered previously unknown species of fish and other marine animals living beneath half a mile of ice in perpetual cold and darkness, posing new questions about the ability of life to thrive in extreme environments. This event is part of STEM Outreach’s series of monthly STEM Cafés, all of which are free and open to the public. Food and drinks will be available for purchase from Eduardo’s.